Still recovering from post concussion syndrome, The Undisputed Greatest Writer of All Time, was written as a test of his cognitive function, with the express desire to nurture his friendship with Derrick Brown. Driven by the unguaranteed nature of life, this collection of poetry bursts with urgency to understand, hunger to explore beyond one’s comfort zone, and attacks the aspects that too often prevent us from having a full life. 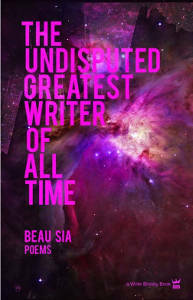 The first book of poetry by Beau Sia in over 13 years, this work is the reflection of the child no longer at the mercy of his childishness. A boy who will not break his father to be a man. A poet whose words are iceberg. 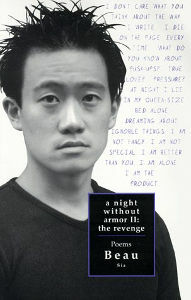 In 1998, Beau Sia didn’t have a prize for a poetry slam he was hosting. Lacking funds, he went to the bookstore and read Jewel’s A Night Without Armor. He then proceeded to spend the next four hours writing A Night Without Armor II: The Revenge, using the same poem titles from Jewel’s book and writing new poems for each. This collection reflects the rebel yell of a child in a celebrity driven culture. Filled with youthful honesty, hilarious angst, and gut punches to the canon, these poems possess a purity few authors allow in their presentations of themselves.